The default is the earrings in the picture, which can be changed to ear clips or ear pins. 【product name】 Cat philosopher under the stars 【Design inspiration】 During the day when I was not at home, one of my family's favorite things was to look out the window on the window sill. The window sill is probably its movie theater. 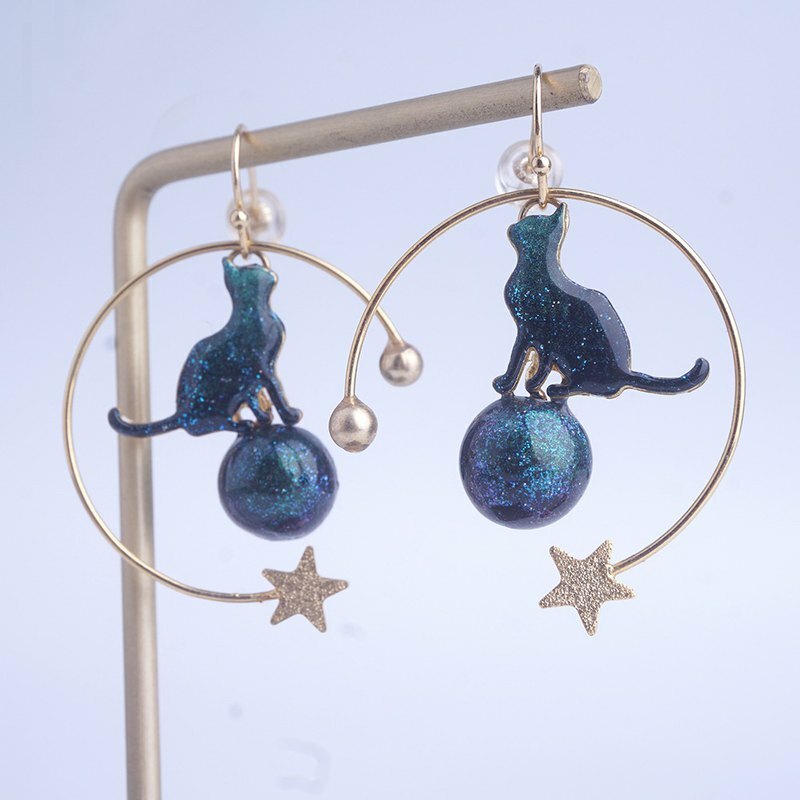 The cat silhouette in the earrings is its true portrayal. It is curious that it is thinking about it. What, probably thinking about its cat life? See the link for the same series of necklaces: https://cn.pinkoi.com/product/iEVVtn4U?category=2 [customized] . This section accepts the ear clip/ear clip. Please refer to the following figure for the style of the ear clip: https://wx1.sinaimg.cn/large/006ZN0asgy1fz8du7jga2j30m809umxg.jpg [Material] . 18k gold-plated fittings, resin, hand drawn [delivery time] . The goods in the museum are hand-made after ordering, and the delivery time is 3-5 working days. [about packaging] At present, there are 1~2 carton packs for one order, and each item will have a separate plastic package; https://wx3.sinaimg.cn/mw690/006ZN0asgy1g1u2x1ki4uj30m80fbn2a.jpg [Basic maintenance] . Try to avoid contact with sweat and other chemicals . When not wearing, it is recommended to place it in a sealed bag to prevent oxidation. 【about delivery】 Hong Kong, Taiwan, Macau: SF Japan, Thailand: EMS Other countries: EMS [About Camellia Cat Design Museum] I am very happy to meet you. My job is a researcher. I love painting and handwriting. Seeing that my little things can shine on others is a higher achievement than writing a thesis. There is a cat in the family, and the name is sixty-six, so the jewelry is mostly made up of cats.